Android: download for free from Play Store! Or take the current development version. iOS (iPhone, iPad): coming in June 2015. 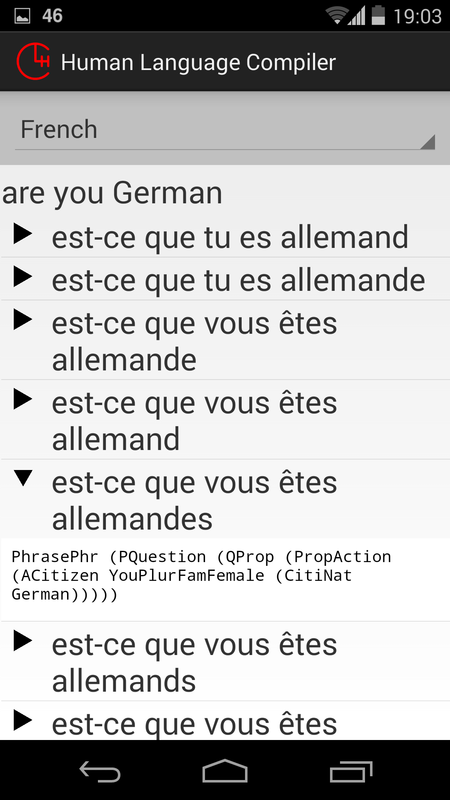 GF Offline Translator is based on grammar and semantics. It is compact in size and gives control on quality. Its technology is inspired by compilers, which are programs that translate computer languages. Most other translators for human language are based on statistics and have less control of quality and are much bigger, so that they require either an internet connection or a huge storage on your phone. Green: semantic translation, should be correct. But not necessarily the only correct one. You can tap the output to see alternatives. Yellow: syntactic translation, should be grammatically correct. But can be very strange in its interpretation and choice of words. 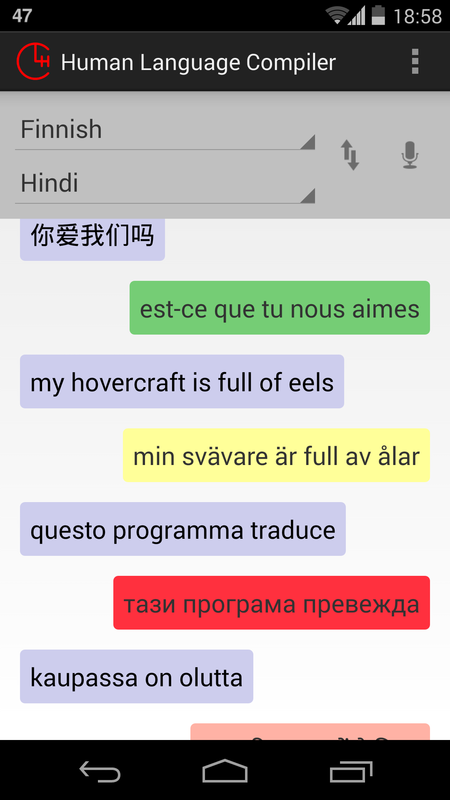 Light red: chunk translation, probably incorrect. Builds the translation from small pieces. Dark red: word-by-word translation, almost certainly incorrect. Builds the translation word by word. The green translations come from a tourist phrasebook, which allows you to translate things like "hello" and "how far is the airport from the hotel". You can translate both speech and text, as selected in the menu in the upper right corner. Both kinds of input can be edited with the keyboard by first tapping at the input field. This is often needed because of speech recognition errors. Changing words from upper to lower case may also be needed. At the moment, Japanese and Thai input must be separated to words, whereas Chinese works without spaces. The speech input and output use Google's voice services. Their status can hence change without notice. You can make it more stable by installing third-party speech tools, such as SVOX, which provides output for most of the listed languages. When you tap on a translation you get a screen with alternative translations. Tapping on each of the alternatives gives you grammatical information: an inflection table, if it is a single word, and a syntax tree otherwise. Powered by GF, built by support from the GF community and from Digital Grammars.